Roof tops are usually unattractive places where heating and cooling equipment, telecommunication towers, and satellite dishes are installed [1Peck SW. Award winning green roof designs: Green roofs for healthy cities. Atglen, Pennsylvania, USA: Schiffer Pub 2008.]. Several decades ago in Europe, and then in other countries, ecologists, anthropologists, sociologists, and environmentalists stressed the need for more harmony between lifeless city buildings and their occupants [2Brenneisen S. Green roofs. How nature returns to the city. Acta Hortic 2004; 643: 289-93. [http://dx.doi.org/10.17660/ActaHortic.2004.643.37] ]. As a result, thousand of hectares of roof-top area in large cities around the world were converted into gardens, as places of recreation or simply esthetically pleasing components of city skylines [3Greater London Authority. Living roofs and walls Technical Report Greater London Authority, City Hall, The Queens Walk, London SE12AA, England ISBN 978 1 84781 132 5 2008.]. These "green roofs" also provide many functional benefits. The most important are energy conservation [4Liu K. Engineering performance of rooftop gardens through field evaluation In: Proc 18th International Convention of the Rooftop Consultants Institute; March 13-16, 2003; Tampa, FL. -8Wong NH, Chen Y, Ong CL, Sia A. Investigation of thermal benefits of rooftop garden in the tropical environment. Build Environ 2003; 38: 261-70. [http://dx.doi.org/10.1016/S0360-1323(02)00066-5] ], cooling effects [9Peng LH, Jim CY. Green-roof effects on neighborhood microclimate and human thermal sensation. Energies 2013; 6: 598-618. [http://dx.doi.org/10.3390/en6020598] , 10Williams NS, Rayner JP, Raynor KJ. Green roofs for a wide brown land: Opportunities and barriers for rooftop greening in Australia. Urban For Urban Green 2010; 9: 245-51. 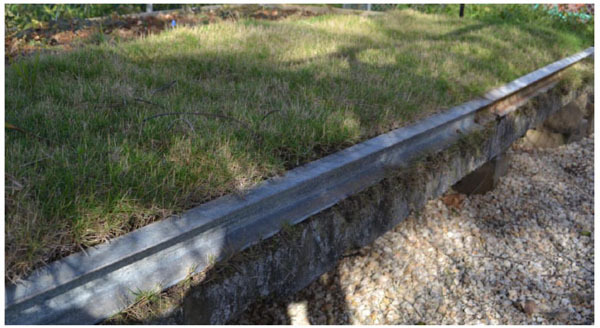 [http://dx.doi.org/10.1016/j.ufug.2010.01.005] ], reduction of city noise [11Dunnett N, Kingsbury N. Planting green roofs and living walls. Portland, Oregon, USA: Timber Press 2004., 12Peck SW, Kuhn ME. Design guidelines for green roofs. Canada Mortgage and Housing Corporation, Ottawa, Canada. Available at: http://www.cmhc-schl.gc.ca. [Accessed on: 15 Sep 2015]], mitigation of air pollution [13Getter KL, Rowe DB. The role of extensive green roofs in sustainable development. HortScience 2006; 41: 1276-85.-15Tan PY, Sia A. A pilot green roof research project in Singapore In: Proc 3rd North American Green Roof Conference: Greening rooftops for sustainable communities; May 4-6 2005; Washington DC. Toronto, Canada: The Cardinal Group 2005. ], delayed storm-water runoff, and improvement of runoff quality [16Dwight RH, Baker DB, Semenza JC, Olson BH. Health effects associated with recreational coastal water use: urban versus rural California. Am J Public Health 2004; 94(4): 565-7. [http://dx.doi.org/10.2105/AJPH.94.4.565] [PMID: 15054006] -18Scholz-Barth K. Green roofs. Storm water management from the top down. Environ Des Construct 2001; 4: 63-70.]. Guam, a tropical island in the western Pacific populated by almost 180 thousand people [19US Census Bureau. Statistical Abstract of the United States. 131st ed. Washington, D.C. 2012. ], serves as major year-round destination for 1.5 million Asian tourists annually [20Guam Visitor Bureau. Available at: http://www.guamvisitorsbureau.com [Accessed on: 15 Sep 2015]]. Because of frequent typhoons and occasional earthquakes since the 1950s, nearly all walls and roofs of residential and commercial buildings are constructed from solid concrete. Concrete buildings are exceptionally strong and safe but also accumulate large amount of heat. The heat is currently removed by air-conditioning units (AC), but the need for AC could be reduced if roofs were shielded from hot sun. Because concrete structures assure exceptional weight safety, roofs on Guam are suitable for establishment of vegetation. Abundant tropical rainfall and selection of appropriate plant species could eliminate or greatly reduce the need for irrigation, making roof vegetation relatively easy to grow and maintain. This study was conducted on Guam (13°N latitude). Eight 3.1m by 0.9m concrete plates were placed on concrete blocks 0.4m above the ground. The plates were 0.13m thick, were reinforced with steel bars, and resembled those used for an ordinary residential roof (Fig. 2 ). Each plate was divided into two 1.5m by 0.9m plots. Steel wire mesh was affixed to the surface of each plate, and a 10cm layer of turf substrate (Scotts Lawn Supersoil®) mixed with sand was spread over four plates on eight of the plots. The other eight plots were left without soil substrate. Four soilless plots were similar in color to a well-maintained concrete surface, and the other four were darkened to resembled a poorly maintained (and unfortunately quite typical) concrete surface covered by black fungi and algae. Temperature differences between bare concrete plates and these covered by vegetation were significant by 3 h after sunrise and reached a maximum within 9 h. On sunny days, plates covered by vegetation were up to 12°C cooler, and on rainy days about 9°C cooler, than bare concrete plates (Fig. 1 ). 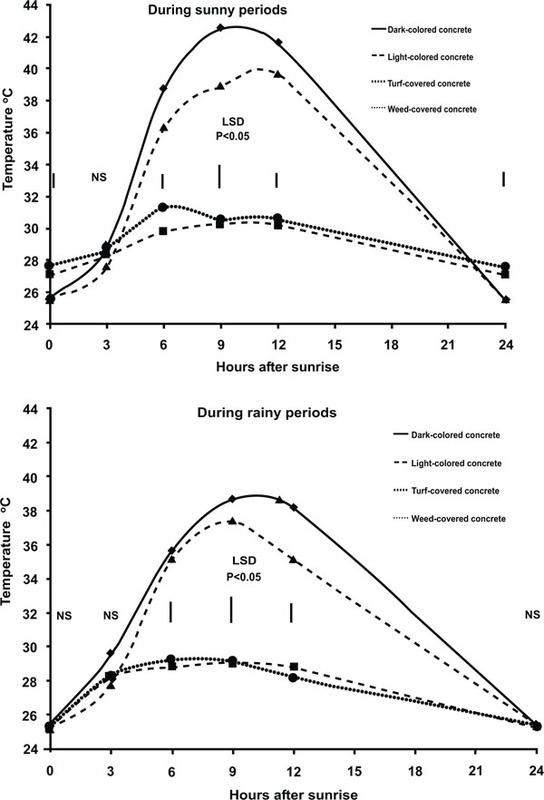 Temperature fluctuations in concrete under vegetation were small on both sunny and rainy days. On sunny days, light-colored concrete was about 3°C cooler than dark-colored concrete; on rainy days, temperature differences were smaller. Temperature of plates covered by turf was similar to that of roof covered by weeds. During sunny days, plates under vegetation cooled down more slowly than did bare concrete and remained at least 2°C warmer at the next sunrise. During rainy days, all plates reached the same temperature by the next sunrise. Collected data indicated that maintaining a concrete model roof surface free of algae and light in color resulted in a meaningful decrease in roof temperature and therefore would decrease the need for AC. Installation of vegetation on the model roof increased this desired effect even more. Santamouris [21Santamouris M. Cooling the cities: a review of reflective and green roof mitigation technologies to fight heat island and improve comfort in urban environments. Sol Energy 2014; 103: 682-703. [http://dx.doi.org/10.1016/j.solener.2012.07.003] ], in his comprehensive review, evaluated results from numerous studies involving green roofs and reflective roofs and concluded that green roofs are advantageous in conserving energy in cold climates, whereas reflective roofs are better in warm and sunny climates. Results from my experiment indicate just an opposite. The clear advantage of the green roof over the reflective roof on Guam results from the location's uniform year-round hot climate. Most of the studies cited by Santamouris were conducted under conditions where green roofs often served as insulation, retaining the structure's internal heat rather than preventing warming. On Guam, concrete roofs are the warmest part of the house structure, and heat is transmitted always toward the inside of the building. In addition, reflective roofs in extremely humid climates are impractical. The rapid growth of dark algae on the roof surface significantly reduces its reflectance within several months after painting, making them expensive to maintain. In future studies, I plan to conduct similar experiments on structures that more realistically simulate house construction on Guam, for example structures at typical roof height and with side walls in place. Liu [22Liu K. Energy efficiency and environmental benefits of rooftop gardens. Green roofs. Construction, Canada 2002; 44(17): 20-3.] reported that roof vegetation reduced energy consumption by 75% during summer months in Ottawa, Canada. Dunnett and Kingsbury [11Dunnett N, Kingsbury N. Planting green roofs and living walls. Portland, Oregon, USA: Timber Press 2004.] reported that every decrease in internal building temperature of 1°C can reduce electricity use by AC up to 16%. Peck et al. [7Peck SW, Callaghan C, Kuhn ME, Bass B. Greenbacks from green roofs: Forging a new industry in Canada. Ottawa, Canada: Canada Mortgage and Housing Corporation 1999.] reported that roof vegetation in southern Canada reduced indoor temperatures by about 4°C when outdoor temperatures were between 25 and 30°C. In this experiment, indoor air temperature was not measured, but observations (not shown) indicate that, during daytime on Guam, heat from a concrete roof can increase indoor temperature by 10°C or more. Using the conservative number of 4°C reported by Peck et al. [7Peck SW, Callaghan C, Kuhn ME, Bass B. Greenbacks from green roofs: Forging a new industry in Canada. Ottawa, Canada: Canada Mortgage and Housing Corporation 1999.] rather than the higher numbers from Guam or Ottawa, calculations recommended by Dunnett and Kingsbury [11Dunnett N, Kingsbury N. Planting green roofs and living walls. Portland, Oregon, USA: Timber Press 2004.] indicate that roof vegetation can reduce AC energy consumption by 64%. On Guam, typical energy consumption by an air-conditioned residential house maintained at 24°C oscillates around 2000 kWh per month [23Guam Power Authority. Available at: http://guampowerauthority.com/gpa_authority/environmental/gpa_planning_reg.php [Accessed on: 15 Sep 2015]]. Because the Guam Power Authority estimates that 75% of all such energy is used by AC, a reduction of 64% could cut total energy use in half. Because the price of electricity on Guam is twice the U.S. average [24US Energy Information Administration. Analysis and projections. Available at: http://www.eia.gov/electricity [Accessed on: 15 Sep 2015]], the benefit of roof vegetation could be immense.